Maintaining your Chevrolet, Ford, Toyota, Scion, Kia, Subaru, Mitsubishi, Chrysler, Dodge, Jeep & Ram properly is the key to vehicle longevity, and our Chevrolet, Ford, Toyota, Scion, Kia, Subaru, Mitsubishi, Chrysler, Dodge, Jeep & Ram service department is standing by to keep your new Chevrolet, Ford, Toyota, Scion, Kia, Subaru, Mitsubishi, Chrysler, Dodge, Jeep & Ram car or SUV running smoothly for years to come. Our highly-trained auto repair technicians will maximize your Chevrolet, Ford, Toyota, Scion, Kia, Subaru, Mitsubishi, Chrysler, Dodge, Jeep & Ram’s vehicle performance. All car repair and Chevrolet, Ford, Toyota, Scion, Kia, Subaru, Mitsubishi, Chrysler, Dodge, Jeep & Ram service includes a multi-point vehicle inspection to identify developing problems so you can avoid future breakdowns. At Shelor Motor Mile Service Center, our factory-trained maintenance technicians are here to provide exceptional service in a timely manner. From oil changes to transmission replacements, we are dedicated to maintaining top tier customer service, for both new and pre-owned car owners. Shelor Motor Mile’s Auto Service Department has been a trusted automotive repair and service center for over 40 years, serving Christiansburg, Blacksburg, Wytheville, Salem, Roanoke, Lynchburg and surrounding areas in the New River Valley. Auto repair service decisions should not be taken lightly. You want to make sure your Chevrolet, Ford, Toyota, Scion, Kia, Subaru, Mitsubishi, Chrysler, Dodge, Jeep or Ram is serviced by factory-trained technicians using the latest state-of-the-art tools and diagnostic equipment, to save you time and money. 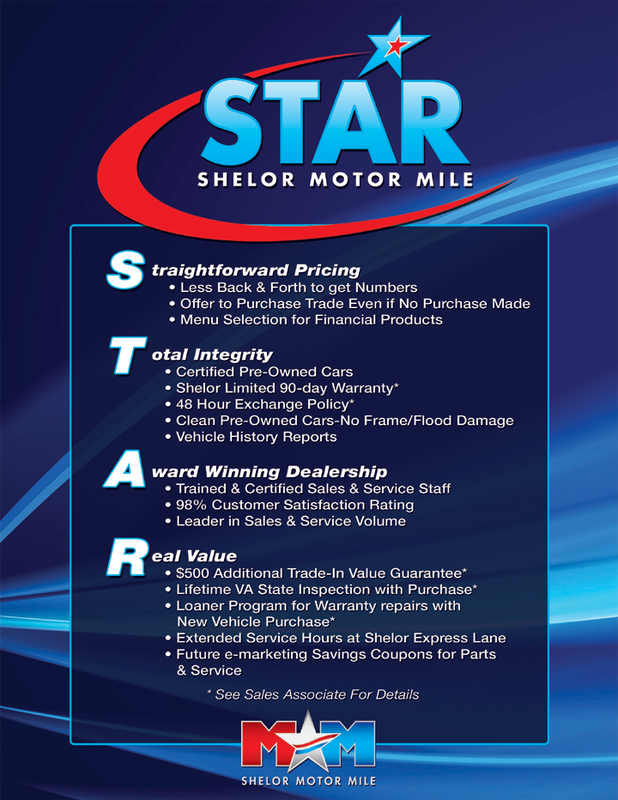 Located at 295 Jarrett Drive, Shelor Motor Mile is your convenient car dealer for Chevrolet, Ford, Toyota, Scion, Kia, Subaru, Mitsubishi, Chrysler, Dodge, Jeep or Ram service and repair in Christiansburg. If you’d like to schedule a service appointment at our Chevrolet, Ford, Toyota, Scion, Kia, Subaru, Mitsubishi, Chrysler, Dodge, Jeep or Ram dealership, please use our online service appointment form, or give us a call at (540) 381-8612. Where is your service department located? We are located at 295 Jarrett Drive, you will want to turn in between Shelor Chevrolet and Hardees and go to the top of the hill, the service building will be on your right. What do I do when I arrive at the building? Please pull up to the door with your vehicles logo above it and honk your horn. When the door is opened please pull all the way into the lane and shut your vehicle off. A service advisor will come to assist you. Where do I come to pick my vehicle back up? Please come to your service advisor to checkout and they will have your vehicle pulled into the service lane. This allows our customers to pick their vehicles up out of any inclement weather. Can I wait for my vehicle while it is being repaired? Yes! We have a customer lounge and offer free wifi, water, coffee and snacks. We also have a children’s play area that you may use while you wait for your vehicle. Can I be taken somewhere while I wait for my vehicle? Yes, we offer a free shuttle service to local areas. Let us know if you would like a ride to a local restaurant, shopping mall or even to work. Where do I go for Toyota/Scion service? Our Shelor Express Care is able to do minor maintenance work for your Toyota/Scion vehicle. If you have an appointment scheduled for your Toyota/Scion vehicle, please go to our Shelor Toyota/Scion service building at 2230 Roanoke Street. Please click here for more information on our Toyota/Scion service department. What Happens After I Schedule an Appointment? Respond to you promptly via your preferred contact method. Ask any additional questions required to service your vehicle. We make sure you receive the best car service Christiansburg has to offer when you trust your car or truck to the experts at Shelor Automotive. There is no issue we haven’t seen and can’t resolve because our knowledgeable mechanics are specialists when it comes to all makes, models, and years. We care about cars and our customers, and they tell us we have the best customer service in the business. We can help get you back on the road whether you need car repair in Blacksburg, Christiansburg, Roanoke, or the surrounding areas. We are conveniently located! Call us today if you find yourself in need of a trusted, professional car mechanic in Roanoke. We want our customers to pay as little as possible to get their vehicle back up and running, and we even guarantee our work. Our experts will find a solution no matter what repair or service issue you’re facing. We can also help with ongoing maintenance as a Roanoke car service dealership. Put your car or truck in good hands and get in touch with the mechanics at Shelor Automotive today. Motor Mile Mitsubishi	37.1342552, -80.3626895.